Undoubtedly one of the most striking skyscrapers in New York City, The Flatiron Building is a 22-story triangular-shaped office building that is perfectly shaped to fill the pyramid formed by the Fifth Avenue, Broadway, and 23rd Street intersection. Reminiscent of an old cast-iron, the Flatiron Building is worldly recognized and a quintessential symbol of New York City. Built in 1902, this 285-foot steel-framed landmark is truly unlike any other building and is worthy of a photograph. Just 4 blocks south of The Evelyn Hotel, take a guided tour through the Flatiron District to hear all about this National Landmark. Annual "23 Days of Flatiron Cheer"
Can you tour the Flatiron Building? There are many group tours offered around the Flatiron District that include attractions like the MetLife Clock Tower, the Appellate Division Courthouse, the New York Life Insurance Building and, of course, the Flatiron Building. Although the building itself is not open to the public, visitors may see the lobby and admire this unique 22-story skyscraper from outside, making the perfect photo op. 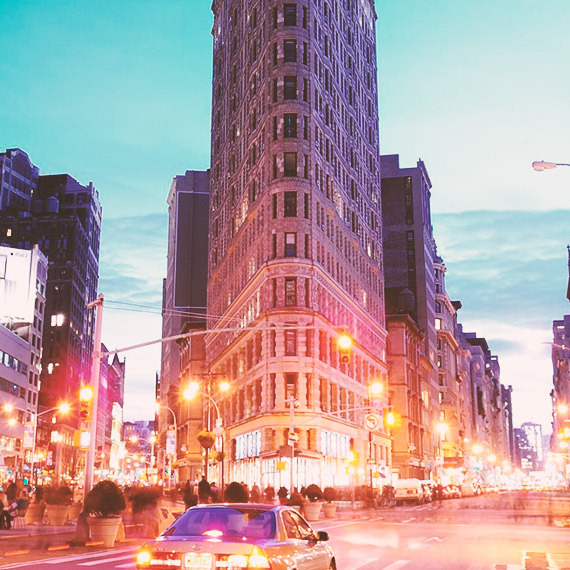 Where is the Flatiron Building located? The Flatiron Building is located just south of Madison Square Park on Fifth Avenue at the intersection of E. 23rd Street and Broadway. Just four blocks from The Evelyn Hotel, it is a quick walk to see this groundbreaking architecture in person. Walk through the park and stop at the first Shake Shack just across from the Flatiron Building for the best burger and shake in the city.